In enteroviruses, Pleconaril prevents the virus from exposing its RNA, and in rhinoviruses Pleconaril prevents the virus from attaching itself to the host cell. Human rhinoviruses (HRVs) contain four structural proteins labeled VP1-VP4. Proteins VP1,VP2 and VP3 are eight stranded anti-parallel β-barrels. VP4 is an extended polypeptide chain on the viral capsid inner surface. Pleconaril binds to a hydrophobic pocket in the VP1 protein. Pleconaril has been shown in viral assembly to associate with viral particles. Through noncovalent, hydrophobic interactions compounds can bind to the hydrophobic pocket. 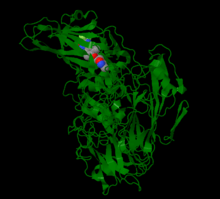 Amino acids in positions Tyr152 and Val191 are a part of the VP1 drug binding pocket. The results of two randomized, double blind, placebo studies found Pleconaril treatment could benefit patients suffering from colds due to picornaviruses. Participants in the studies were healthy adults from Canada and the United States, with self-diagnosed colds that had occurred within 24 hours of trial enrollment. Participants were randomly given a placebo or two 200 mg tablets to take three times daily for five days. To increase absorption it was recommended to be taken after a meal. To monitor the effectiveness of Pleconaril, participants recorded the severity of their symptoms and nasal mucosal samples were obtained at enrollment, day 3, day 6 and day 18. The two studies had a total of 2096 participates and more than 90% (1945) completed the trial. The most common reason for a participant not finishing the trial was an adverse event. Pleconaril treatment showed a reduction in nose blowing, sleep disturbance, and less cold medication used. 1 2 "Effects of Pleconaril Nasal Spray on Common Cold Symptoms and Asthma Exacerbations Following Rhinovirus Exposure (Study P04295AM2)". ClinicalTrials.gov. U.S. National Institutes of Health. March 2007. Retrieved 2007-04-10. ↑ Pevear D, Tull T, Seipel M, Groarke J (1999). "Activity of pleconaril against enteroviruses". Antimicrob Agents Chemother. 43 (9): 2109–15. PMC 89431 . PMID 10471549. ↑ Ronald B. Turner; J. Owen Hendley (2005). "Virucidal hand treatments for prevention of rhinovirus infection". J Antimicrob Chemother. 56 (5): 805–807. doi:10.1093/jac/dki329. PMID 16159927. ↑ Liu, Y; et al. (2015). "Structure and inhibition of EV-D68, a virus that causes respiratory illness in children". Science. 347 (6217): 71–74. doi:10.1126/science.1261962. 1 2 3 Schmidtke, Michaela; Wutzler, Peter; Zieger, Romy; Riabova, Olga B.; Makarov, Vadim A. (2009). "New pleconaril and [(biphenyloxy)propyl]isoxazole derivatives with substitutions in the central ring exhibit antiviral activity against pleconaril-resistant coxsackievirus B3". Antiviral Research. 81 (1): 56–63. doi:10.1016/J.ANTIVIRAL.2008.09.002. 1 2 Ledford, Rebecca M.; Collett, Marc S.; Pevear, Daniel C. (1 December 2005). "Insights into the genetic basis for natural phenotypic resistance of human rhinoviruses to pleconaril". Antiviral Research. 68 (3): 135–138. doi:10.1016/j.antiviral.2005.08.003. 1 2 3 Pevear, D. C.; Hayden, F. G.; Demenczuk, T. M.; Barone, L. R.; McKinlay, M. A.; Collett, M. S. (26 October 2005). "Relationship of Pleconaril Susceptibility and Clinical Outcomes in Treatment of Common Colds Caused by Rhinoviruses". Antimicrobial Agents and Chemotherapy. 49 (11): 4492–4499. doi:10.1128/AAC.49.11.4492-4499.2005. ↑ Rotbart, HA (February 2002). "Treatment of picornavirus infections.". Antiviral Research. 53 (2): 83–98. doi:10.1016/s0166-3542(01)00206-6. PMID 11750935. ↑ Braun, Heike; Makarov, Vadim A.; Riabova, Olga B.; Wutzler, Peter; Schmidtke, Michaela. "Amino Acid Substitutions At Residue 207 of Viral Capsid Protein 1 (VP1) Confer Pleconaril Resistance in Coxsackievirus B3 (CVB3)". Antiviral Research. 90 (2): A54–A55. doi:10.1016/j.antiviral.2011.03.100. ↑ Schmidtke, Michaela; Wutzler, Peter; Zieger, Romy; Riabova, Olga B.; Makarov, Vadim A. "New pleconaril and [(biphenyloxy)propyl]isoxazole derivatives with substitutions in the central ring exhibit antiviral activity against pleconaril-resistant coxsackievirus B3". Antiviral Research. 81 (1): 56–63. doi:10.1016/j.antiviral.2008.09.002. ↑ Thibaut, Hendrik Jan; De Palma, Armando M.; Neyts, Johan. "Combating enterovirus replication: State-of-the-art on antiviral research". Biochemical Pharmacology. 83 (2): 185–192. doi:10.1016/j.bcp.2011.08.016. 1 2 3 4 5 Hayden, F.G.; Herrington, D.T. ; Coats, T.L. ; Kim, K.; Cooper, E.C. ; Villano, S.A.; Liu, S.; Hudson, S.; Pevear, D.C.; Collett, M.; McKinlay, M. (Jun 15, 2003). "Efficacy and safety of oral pleconaril for treatment of colds due to picornaviruses in adults: results of 2 double-blind, randomized, placebo-controlled trials.". Pleconaril Respiratory Infection Study, Group. Clinical Infectious Diseases. 36 (12): 1523–32. doi:10.1086/375069. PMID 12802751. ↑ Greenwood, Veronique. "Curing the Common Cold". Scientific American. Retrieved 2013-03-25.